It's no secret that I have a penchant for canned baked beans. On certain days, those squidgy beans oozing all over my dinner plate are the only thing that will do. Paired with steamed broccoli, they're a soothing time machine to my youth and something like soul medicine. I've done baked beans from scratch the James Beard way, and while the challenge was fun, I realized that that fancy version would never be able to live up to my beloved stuff in a can. That might have been liberating knowledge, but something else nagged at me. After all, reading the ingredient label on those cans was never a good time. The amount of sugar sort of alarmed me. Besides, somewhere out there people were doctoring their cans of beans and that totally intrigued me. (Is this an official low point? Admitting that doctoring beans is intriguing to me? I have to hope I'm not alone.) Could there be a middle ground - somewhere between totally-from-scratch beans and the sugar-dredged canned ones? There could be and there was. Melissa Clark, in her new column at the New York Times, wrote about her version of homemade baked beans last week. But since I'd already gone the dried bean route, I decided to make the more streamlined version of her recipe. I dumped a few cans of pinto beans (I like them better than white beans) with their liquid (shudder) into a pot along with a pungent slurry of ketchup, vinegar, dried mustard, Tabasco sauce and pepper. And since I've always been used to vegetarian baked beans, I eschewed the bacon in Melissa's beans for a knife-tip of smoked pimenton de la vera. I brought the mixture to a simmer and let the whole thing cook gently until the liquid reduced. I put a sticky ladleful of beans into a bowl and dug in. Somewhat skeptically, I might add. 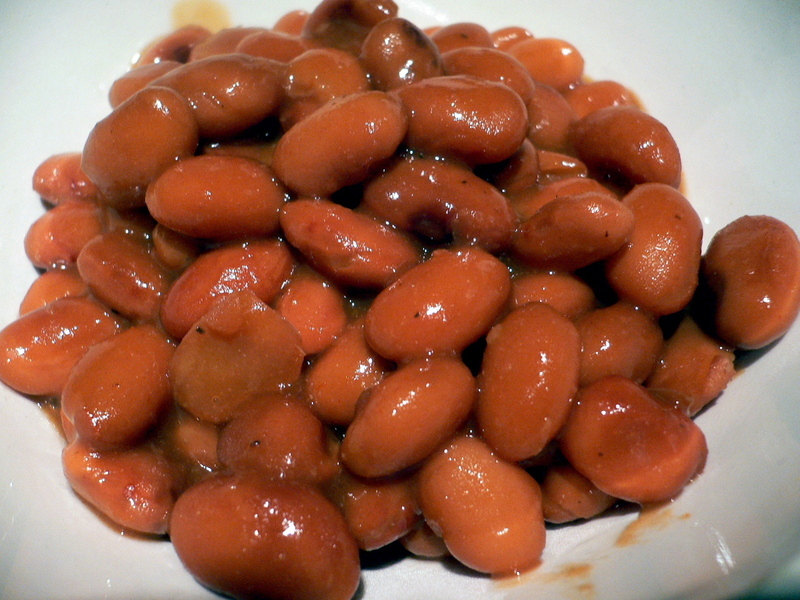 How could such a simple process result in anything as good as factory-produced baked beans? Just to be on the safe side, I also made a bowlful of Molly's escarole salad. Vitamins and a back-up dinner (awfully tasty, I might add), should the need arise. Oh, I can be such a fool. Because - spicy, smoky, sweet and complex - these were some seriously good canned beans. Fast, cheap, easy, wholesome and entirely homemade. So I didn't soak those pellet-y little beans for endless hours and then cook them into oblivion! Big deal. I can't believe I might never buy canned baked beans again. 1. Put the beans, with their liquid, in a pot. In a small bowl, mix together ketchup, molasses, vinegar, mustard powder, Tabasco and pepper. Pour mixture into beans and stir well. 2. Bring everything to a simmer. Let simmer over low heat until beans are thickened, about 30 to 45 minutes. Season with salt if needed.